Toronto International Film Festival has come to an end, and has announced the winners for this year. As selected by a jury from the Network for the Promotion of Asian Cinema, the NETPAC Award for World or International Asian Film Premiere goes to Anup Singh’s Qissa. Jury members include Jay Jeon (Korea), Intishal Al Timimi (Abu Dhabi) and Freddie Wong (Hong Kong). The jury remarked: “The NETPAC Award for the best Asian film at Festival 2013 goes to Qissa, directed by Anup Singh, for its sensitive portrayal of the issues of identity and displacement that affect people not only in India, but in all parts of the world and for brilliance of cinematic craft and the choice of metaphor that has been employed to tell a moving story that is bound to provoke thoughts, spark debate and give its viewers an intense experience. Set amidst the ethnic cleansing and general chaos that accompanied India’s partition in 1947, this sweeping drama stars Irrfan Khan — also appearing at the Festival in The Lunchbox — as a Sikh attempting to forge a new life for his family while keeping their true identities a secret from their community. 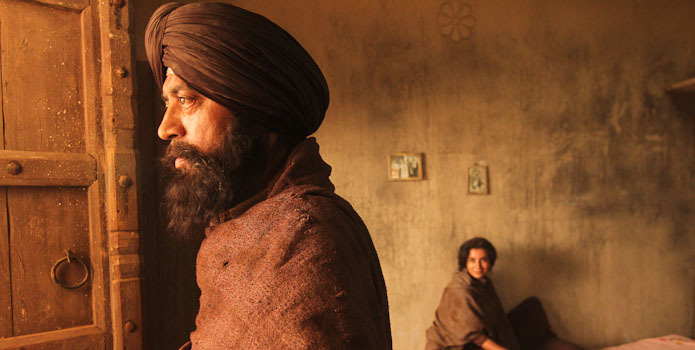 Beautiful, timeless, and touching the deepest of human impulses, Qissa carries the spirit of a great folk tale. Although it’s set in a particular time and place — the Punjab region that straddles India and Pakistan in the years immediately after partition — it is both deeper and broader than any one moment. As this eerie family drama progresses, it cuts to the heart of eternal desires for honour, empathy, and love. One of India’s best actors, Irrfan Khan (Life of Pi, Festival premiere The Lunchbox, and a feature guest in this year’s Mavericks programme) plays Umber Singh, a Sikh uprooted by the religious violence that came with partition in 1947. He and his family move to a safer locale, and it is here that the story takes a remarkable turn. Having already fathered daughters, Singh now wants a son. When his next child is born he celebrates his wish come true, but there is one problem: the baby is in fact a girl. “Qissa” is originally an Arabic word meaning folk tale. Both the word and the idea migrated from the Gulf into the Punjab, still connected by the ancient oral narratives handed down in communal settings. Working within this tradition, director Anup Singh gives his film both the grand themes and elemental emotions of classic storytelling. As Umber’s daughter is raised as a boy, the characters are propelled with greater and greater urgency towards their inevitable fates. Part of a new generation of directors with feet firmly planted in India and far beyond, Singh has delivered a film immediately accessible to anyone sensitive to the conflicts that drive classic stories: fear versus hubris, individual need versus social codes. Qissa is a Punjabi story for the whole world. Anup Singh was born in Dar es Salaam, Tanzania. He has written film reviews for Sight & Sound, directed Indian television, and consulted for BBC Two. His features as director are The Name of a River (02) and Qissa (13). The only problem I have had with Qissa is that the sound track does not corroborate the film. Perhaps, Anup Singh, the director, could have done it better. In other words, Arabic rhythm in a serious Punjabi film! I mean, come on It doesn’t work. Although “Qissa is a Punjabi story for the whole world,” but the sound track fails to convey such notions. What I am saying the sound track of the film does not completely enforce Desi taste at all. Qissa deserved NETPAC Award at TIFF 2013.